Apple's iPhone 5 is still relatively new to store shelves, but a French tech blog claims to have acquired photos of components destined not only the rumored iPhone 5S but the so-called iPhone 6 as well, with one of the models speculated to launch in a matter of months. 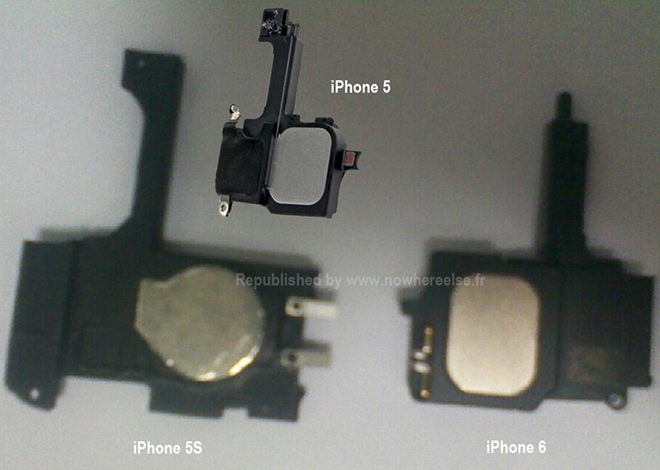 NoWhereElse.fr on Friday published the images of what it claims are loud speaker modules for the iPhone 5S and the iPhone 6. The images, the site claims, come from a source connected to an Apple supplier that makes the components. The site contends that Apple will deviate from its normal schedule of releasing one iPhone per year and instead roll out as many as two iPhones in 2013. The iPhone 5S will allegedly serve as an incremental improvement on the iPhone 5, while the iPhone 6 will be a more substantial redesign, though no details were reported as to the possible differences between the two. A third iPhone model has also been rumored as the so-called iPhone Math (or iPhone +, depending on the interpretation), a larger-screened iPhone meant to give Apple a stake in the nascent but growing "phablet" sector. The additions to the iPhone line would also come with alterations to Apple's release schedule, according to the report. One of the rumored models would launch between March and July of this year, while a second would be released toward the end of the year. The pictured components, while out of focus, do bear some resemblance to the loud speaker unit from the iPhone 5, which the author of the report superimposed onto one photo for comparison. Based solely on the images, it's difficult to say with any certainty how likely they are to turn up inside a future Apple device. Should the iPhone 5S and iPhone 6 materialize as described in the report, it certainly wouldn't be the first time components have leaked prior to the release of an Apple device. As recently as this past October, weeks before the launch of the iPad mini, images of the device's front and back panels appeared on the Internet, with photos of the device's Wi-Fi, GPS, and Bluetooth antennas following early on the day of its announcement. This past month has seen a flurry of rumors about the paths Apple might take with the next generation of its industry-leading smartphones, even though the most recent version debuted only a few months ago and continues to see sales that outstrip supply. Driven possibly in response to analyst concerns that Apple must make a cheaper iPhone to compete in emerging markets, some reports have the Cupertino company working on a model with polycarbonate backing. Asked directly about this possibility during the company's quarterly conference call this week, Apple CEO Tim Cook parried the question, saying he would not go into Apple's pricing strategy but that the company "[feels] great about the opportunity of getting products to customers."